One of his hobbies is dirt biking. He rides when he is not in school. Ryan is the son of Dave and Jodi. He also has a sister Courtney and two dogs, Sadie and Sampson. Apple trees are not indigenous to North Carolina, but they have been growing in areas of the state, where temperatures are cooler, for hundreds of years. The “classic and charming” cottage on Gray Road where Julie had found some well-deserved happiness is not one of those areas. In fact, when Mama’s father was alive, many locals would accuse him of purchasing the apples he gave to his wife to make the jelly that he would sell. The apple tree produced so much fruit during those years that there was always an abundance of pies, tarts and sauces for anyone who happened by the house. “Jeremy said it’s lonely.” Julie timidly offered realizing how hair-brained she must’ve sounded. “Ha, that kid he a hoot, ain’t he. Who talks to trees? That boy, that’s who, the tree whisperer, ha that him.” Mama was smiling at the thought of the boy talking to the tree, and was suddenly struck by the memory of her father sitting under the tree on his bench, the one that he built, his lips moving and head nodding. At the time, Mama assumed that her father was just talking to himself, but now she wondered if he was conversing with the majestic tree as well. It was on a hot night in August, when Jeremy confirmed that the tree had, in fact, noticed all of the work that had been accomplished in the yard. “She’s happy, Mama,” he said laying under the tree during a night of star watching. “Who?” asked Julie, forgetting momentarily about the tree. “The tree silly. She’s happy now.” The tree wasn’t the only one who was happy. Jeremy had become a different kid right before Julie’s eyes. Although his body was still a non-stop train racing toward a destination that didn’t exist, he had found a new sense of calm, not of body, but of mind. He could spend small amounts of time, mostly immobile, at the table coloring, or reciting the alphabet, something that had evaded Jeremy previously. Lily adored Mama and smiled, brightly, each time she appeared. There were many occasions when Lily would call out “Mama” only to be disappointed when Julie responded. The hustle and bustle of the home, once a source of distraction for Julie, soon became her sanctuary. Julie began to look forward to the commotion that Mama and her large, boisterous, and caring family delivered. While Julie had never considered herself as being an unhappy person, she came to realize that she had been mistaken, for in the first time in a very long time she was truly happy. And before she knew it, their lives settled in to a new routine; a new normal; a better than normal. And, Julie noticed, that neither of the kids had mentioned their father. The Windham Veterans of Foreign Wars, Post 10643, wants to express their appreciation for a very generous donation recently received from the students and staff at Windham Middle School. Sixth grade teacher Emily Stokes presented the VFW with a check for $700. During May and June, the Friends of Rachel (FOR) club sponsored a fundraiser to raise money for RSU14 Special Olympics and local Veterans. Students and staff at Windham Middle School participated in the first Penny Olympics, a competition between homerooms to see which homeroom could raise the most money. There was a high level of competition with the goal to raise money for both groups. Students and staff raised over $1,400 with each group receiving half of the total funds raised. The FOR group anticipates sponsoring the fundraiser again this year. 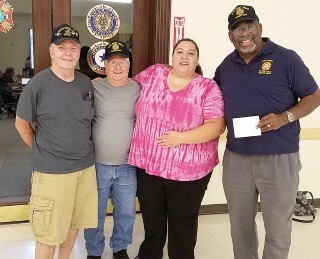 “The Windham VFW helps local veterans and it is heartwarming to know local teachers and students know what we do and entrust us with this gift to help continue outreach,” said VFW commander Willie Goodman. Emily Stokes stands with Veterans of Foreign Wars members Stan Bourke, Walter Brayley and Willie Goodman. The Raymond Village Library is happy to announce a long list of events that will occur this fall, in addition to eagerly spreading the word of the new incoming director who will oversee the library and its programs with duties beginning Mid-September. Emily Allen, president of the Raymond Village Board of Trustees stated she is very happy to share that the fall schedule includes a wealth of information and is very pleased with the selection of the new library director. The new director who will be coming on board soon will be Allison Griffin. “We couldn't be more excited about our incoming director Allison Griffin. She is currently the Library Director at Bridgton Library and we are so lucky to have her interested in moving closer to home and coming to the helm of Raymond Village Library. She has a wealth of knowledge and experience and we can't wait to have her join us mid-September,” said Allen. The events and programs offered this fall will provide lifelong learning opportunities to include exciting informational, educational and cultural programs with the hope of meeting the needs and interests of Raymond residents and its surrounding great lakes community members, said Allen. The library will hold its monthly book group on Monday, August 29th from 7 p.m. to 8 p.m. The book to be discussed is The Supremes at Earl’s All-You-Can-Eat by Edward Kelsey Moore. The book group is open to new members and anyone in the community is free to join the group to learn more about the book and to become a part of a fun and educational gathering. The many other variety of programs offered this fall will begin with a wellness series from local herbalist Deb Gideon that will meet on Wednesdays, September, 7, 14, and 21. Other events planned are Maine writer Chris Holm is coming to speak about his new books on Wednesday, September 28; Nancy Milliken Mason will speak about DNA Genealogy on Wednesday, October 5; Ingrid LaVasseur will present thermography in breast cancer screening on Wednesday, October 12; and Maine writer Brenda Buchanan will speak on Wednesday, October 19. Allen stated that the fall program schedule will end with “the Zany, Majestic Bard, sponsored by the Maine State Library and hosted with the Windham Public Library at WHS Performing Arts Center on Thurs. October 20.” She invites the public to help celebrate the end of the packed fall schedule. The word sustainability is used to describe many products, from wooden sunglasses to prefabricated toilet systems. However, in terms of gardening, the movement in sustainability, as Planet Natural describes it, “isn’t a commodity as much as it is a lifestyle. It has immediate as well as long term rewards.” The Windham Community Garden, created in 2010, was established to promote this very lifestyle as well as to provide for members of the Greater Windham community. “Our mission is to follow organic practices, provide affordable garden beds and to promote a green and sustainable Windham”, stated Marge Govoni, co-chair of the Windham Community Garden Committee and one of the founders of the club. The Windham Garden Club’s website clearly states that it also strives to grow, harvest and distribute produce to those in need while serving as a community building and educational resource to all residents. Govoni stated that the community garden committee began as a few interested individuals who saw a need for a sunny garden location for many in the Windham community. Govoni stated that she and other garden committee members realized that many Windham area residents have beautiful yards naturally landscaped profusely with beautiful trees. However, as a result of shady conditions, homeowners find it difficult to grow a healthy and productive garden. Govoni said, “I felt that it would benefit the community to have a place where people who could not grow plants in their own yards would have a place to grow their own food.” Govoni and the other concerned individuals were correct regarding this community need, as there are on average, 50 to 60 gardeners who use the community gardens every season. The community garden is located on Route 202, near the public safety building in Windham next to the skate park. The one acre of land available to the garden club is on loan from the Town of Windham and three quarters of that land is usable for gardening. The website states that the garden beds, 10’ x 20’ in size, are available to any Windham community member on a first come first serve basis with a cost of $30 per season. Organic compost along with some organic pesticide treatments are provided. Spigots have been installed and the water is provided by the town and fire department and is easily accessible to all garden plots. As with any garden, pests are a major issue and concern. This year, the greatest challenge faced by the community garden was the vole population. Govoni stated that despite the fact that voles are very difficult to control, harvests has been outstanding despite them. Many community gardeners will donate the extra food produce to the Windham Food Pantry which is located on the other side of the public safety building.